Not quite. Coulter’s tweet is factually wrong and foolishly composed. As for foolishness, it is surely foolhardy to remind Americans (and the world) that Republicans ruled when the Great Depression emerged. Strikingly, the Alt-Right agenda – which Coulter extols and Trump apparently will pursue – includes protectionism and trade wars which exacerbated the Great Depression. 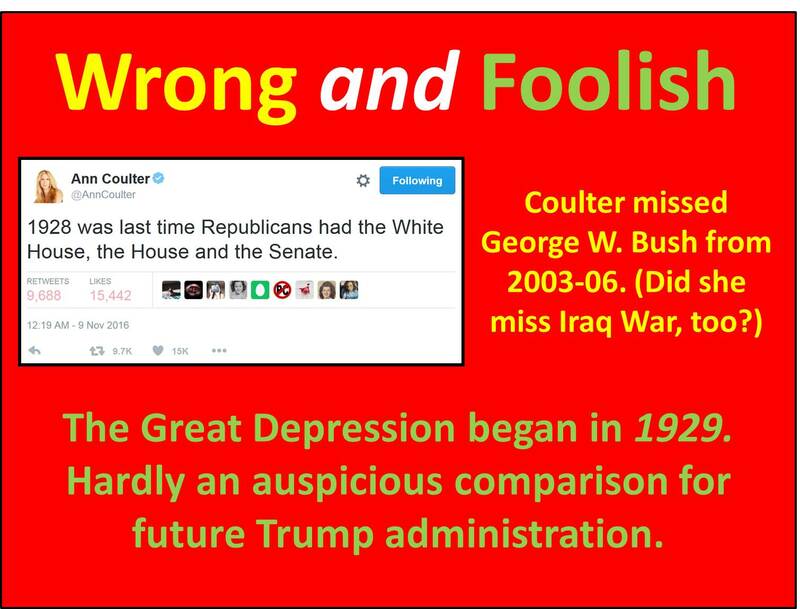 But this isn’t the first time Coulter has made an arse (a good Anglo-Saxon word) of herself with regards to the Great Depression. Somehow, Coulter forgot all about the Great Depression! Coulter prides herself on her “fanatical” (her word) research. Perhaps she needs more research and less fanaticism. Since the 1990s, Ann Coulter has expressed her hatred for individuals and entire groups of people. Moreover, she has called hatred a patriotic duty. Not surprisingly, Coulter hates those who are not like her. She hates, in others words, what she isn’t. But Coulter also hates who she is. Indeed, Coulter hates what she isn’t because of who she is. Let’s look at who and what Coulter hates and see how, in reality, she hates herself. Notice, Coulter hates conservatives who disagree with her. Part of her shtick is that she is always right, never wrong. When Coulter-generated controversies inevitably arise, she attacks and reviles those who hold her accountable for her words and actions. Moreover, Coulter often has an agenda which is distinct from, and in opposition to, conservative principles. Consequently, Coulter vilifies those principled conservatives who oppose her. Despite her claims of fealty to Christ, Coulter has attacked Christians for most of the past two decades. Coulter calls Christian missionaries “fake Christians,” attacks Christians who are godly and promote godliness, and opposes attempts to stop Christian genocide occurring overseas. Contrary to her assertion, Coulter passionately attacks conservatives and Christians for pursuing a pro-life agenda. As far back as the late 1990s, Coulter began attacking pro-lifers for purely political purposes. Coulter blames pro-life “putzes” for Republican election defeats – because they pursue a pro-life agenda. Coulter disparages pro-lifers as morons and cowards for simply seeking to defund Planned Parenthood! She calls them “pathetic,” “weak-kneed” “sissies” and “pussies” trying “to prove their toughness by being pro-life.” Perhaps they are actually principled pro-lifers. In reality, Coulter would have pro-lifers do nothing and let the unborn fend for themselves! Even narcissists can experience self-doubt. More than that, two decades of compromising principles and behaving deceitfully have taken their toll. In time, liars tend to believe their own lies. But each lie conflicts with a previous one until discerning the truth becomes like grasping the wind. Coulter went from espousing principled positions to behaving contrary to those very same principles. Confronted with her hypocrisy, she entered into a prolonged and deep denial from which she has yet to recover. She eventually gave up trying to do the right thing. The “mass of contradictions” in her life quickly snowballed out of control. In time, Coulter – all the while claiming she has never changed – dramatically changed her positions and views on almost everything. Consequently, huge swaths of the conservative movement, Christians, pro-lifers, libertarians, and the like now shun Coulter. They will continue to do so until Coulter gets her act together. Even then, she will have to earn their trust. Right now, Coulter is extremely confused, caught up in a mishmash of conflicting and confusing visions of herself – her self-identity – and a worldview which has become warped from years of lies, treachery, and deceit. I suspect that Ann never really believed in the Christian ideals and conservative principles she espoused. Indeed, she was not the “true believer” everyone believed her to be. Rather, she adopted those ideals and principles from her parents, whom she loved. Her father died in 2008; her mother in 2009. Since then, Ann’s moral and spiritual compass no longer exists. Ann is being tossed to and fro by the pragmatism of the moment and the passing whims of her heart. Coulter hates conservatives, Christians, and pro-lifers for being what they are because she once believed she belonged in those categories. Now, whenever these people of principle act on their principles, she is put to shame as a charlatan. They expose Coulter for who she really is – a fraud. Will Ann always be a fraud? Only God knows and only He can bring meaning and direction to her life. Unless and until Ann courageously faces the reality of who she has become and fights the good fight of faith to become the person God has called her to be, she will always be filled with hate and fear. May God grant Ann repentance and transform her heart. See “Chapter 7: Love: God’s Desire and Goal for Us,” The Gospel According to Ann Coulter, available as a free download at www.coulterwatch.com/gospel.pdf. See “Appendix 1: Sampling of Coulter’s Elimination Rhetoric,” The Gospel According to Ann Coulter, available as a free download at www.coulterwatch.com/gospel.pdf. See “Chapter 8: Polemics R Us,” The Beauty of Conservatism, available as a free download at www.coulterwatch.com/beauty/pdf. See “Case Study # 3: Xenophobia: Soccer Flops and Nativism Gone Amok,” Propaganda: Orwell in the Age of Ann Coulter, available as a free download at www.coulterwatch.com/propaganda.pdf. Coulter’s narcissism is renowned. Nevertheless, she has an insatiable appetite for self-glory to prove her worth and her superiority to herself and to the world. See Vanity: Ann Coulter’s Quest for Glory, available as a free download at www.coulterwatch.com/vanity.pdf. Ann Coulter, YAF interview, “Hot Babes will Spark the Conservative Movement,” 8/8/11. See “Case Study # 5: Coulter v. Tea Party,” Propaganda: Orwell in the Age of Ann Coulter, available as a free download at www.coulterwatch.com/propaganda.pdf. See “Conservatives Diss Coulter!” at http://wp.me/p4jHFp-8V. 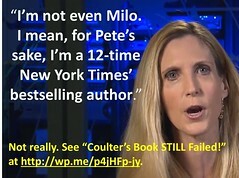 See Never Trust Ann Coulter – at ANY Age, available as a free download at www.coulterwatch.com/never.pdf. “Church Militant: Ann Coulter on God, Faith, and Liberals,” beliefnet.com, 2006, http://www.beliefnet.com/story/196/story_19646.html. See also “Ann Coulter is Not a Good Person – An Open Letter to Erick Erickson” at http://t.co/7LQTKwbWcg. 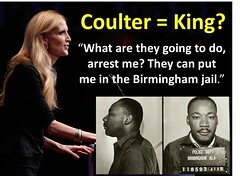 See The Gospel According to Ann Coulter at www.coulterwatch.com/gospel.pdf. See “Case Study # 4: Coulter v. Christians,” Propaganda: Orwell in the Age of Ann Coulter, available as a free download at www.coulterwatch.com/propaganda.pdf. See “Coulter Attacks Christians for Being Godly” at http://wp.me/p4jHFp-az. See “Let Them Be Martyred!” at http://wp.me/p4jHFp-aR. Ann Coulter, quoted by Emily Freund, “Ann Coulter: She May Be Right …” Westchester WAG, October 2002. See The Gospel According to Ann Coulter at www.coulterwatch.com/gospel.pdf. See “Case Study # 8: Life Issues,” Propaganda: Orwell in the Age of Ann Coulter, available as a free download at www.coulterwatch.com/propaganda.pdf. See “Coulter’s Assault on Pro-Life Movement Continues” at http://wp.me/p4jHFp-9a. See “Ann Coulter Still Blind to Abortion” at http://wp.me/p4jHFp-9I. See Vanity: Ann Coulter’s Quest for Glory, available as a free download at www.coulterwatch.com/vanity.pdf. See “Ann Coulter’s Root Causes – Part 1 (12/8/1961)” at http://t.co/VSsvq9UBlF. See “Ann Coulter’s Root Causes – Part 2 (9/11/1997)” at http://t.co/UOApDASifV. 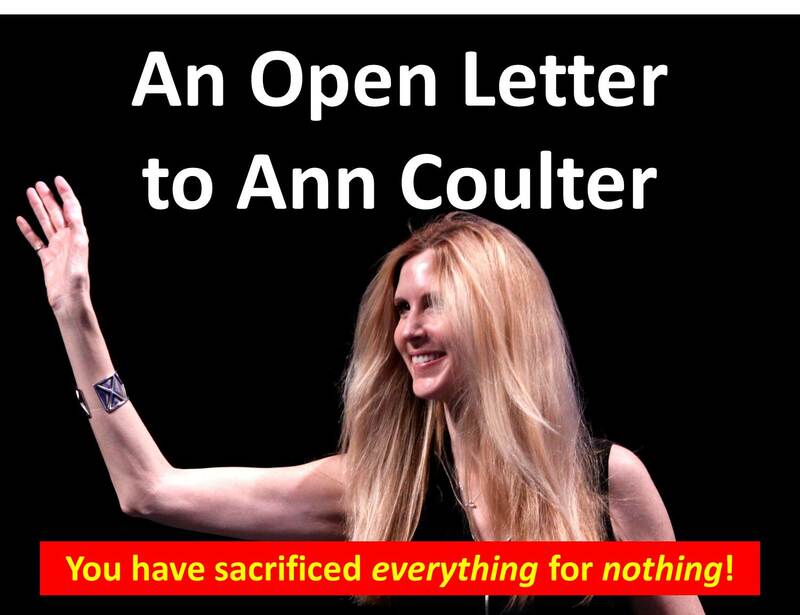 See “An Open Letter to Ann Coulter” at http://wp.me/p4jHFp-cK. See “Ann Coulter’s Growing Irrelevancy” at http://wp.me/p4jHFp-8Y. See “Ann Coulter’s Crazy Funhouse Mirror” at http://wp.me/p4jHFp-8n. See Propaganda: Orwell in the Age of Ann Coulter, available as a free download at www.coulterwatch.com/propaganda.pdf. Polemicist Ann Coulter’s next book, In Trump We Trust, is slated for release in August. This paean to The Donald will indisputably prove Coulter to be a bigger fraud than Trump. Ten years ago, Coulter vilified the Left, denouncing godless liberals, but now she calls one her Savior. Coulter has long worshipped this candidate whom she herself has characterized as a fraud and mental. Will In Trump We Trust incorporate the following sentiments already expressed by Coulter? Was Coulter ever a conservative? A Christian? Coulter may trust The Donald (she has, after all, staked what’s left of her reputation and her career on his success), but we, the People, are not required to blindly worship him as she does. Ann Coulter’s blind worship of a godless liberal is yet another reason to never trust Ann Coulter. 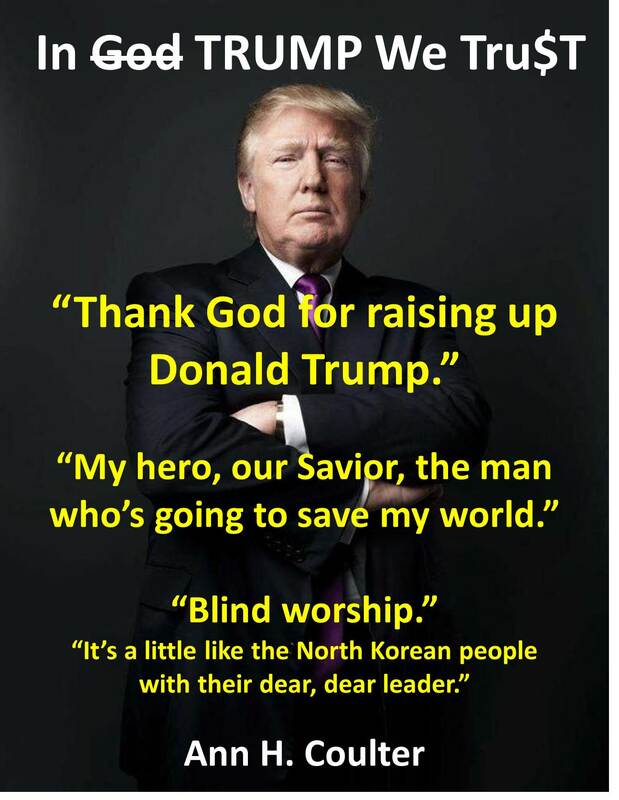 See “No Better Than Trump!” at http://wp.me/p4jHFp-dW. Ann Coulter, Eric Metaxas Show, Salem Media Group, 1/12/16. Ann Coulter, Alan Colmes Show, Fox News, 1/15/16. Ann Coulter, Joyce Kaufman Show, WFTL, 12/17/15. Ann Coulter, Sean Hannity Show, Premiere Radio Networks, 1/19/16. 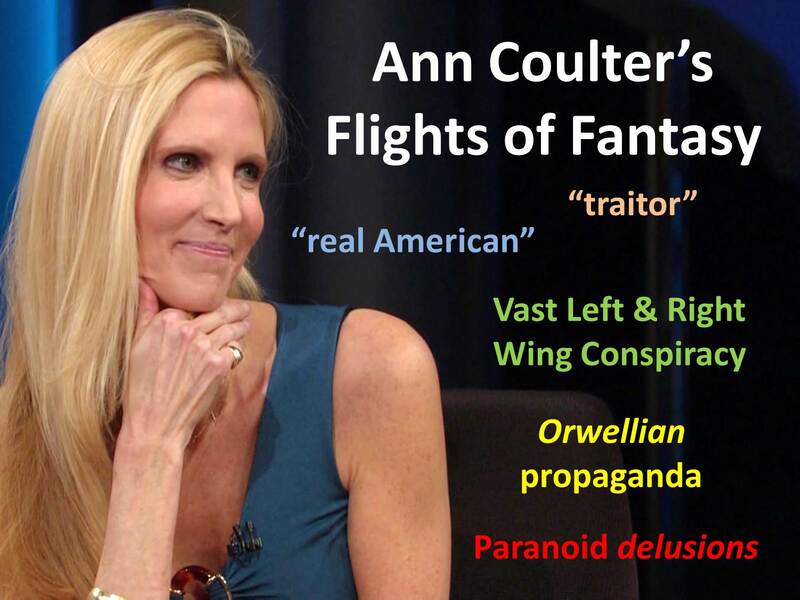 Given her frequent flights of fantasy, one wonders why anyone listens to Ann Coulter. Recently, Coulter insisted that she could arrange a détente which would yield her Dream Ticket: Trump-Romney. Simply delusional. Since then, Coulter has been spiraling downward. Coulter has redefined terms, such as “real American,” traitor,” and “patriot,” spoken of vast conspiracies, and displayed paranoia. Employing a variety of Orwellian techniques, Coulter has become a propagandist who is no longer able to discern fact from fantasy. Nemo has drunk the Coulter-aid. In truth, Coulter abandoned Conservatism and Christianity many years ago. As for the rule of law, why is she constantly lying about it? Coulter continues to lie about Supreme Court cases in order to influence national politics. The person Coulter said she blindly worships as her Savior, The Donald, is not a conservative! Moreover, Trump cares about what is best for Trump, not for America. For decades, Coulter has defined who “real Americans” are per her own malleable standards. As I noted last September, Coulter was wrong then and she is wrong now! Coulter defines not only who Americans are but she also pinpoints where the traitors can be found. In 2003, Coulter declared as traitors everyone who disagreed with even just one item of the GOP platform. To her, all Democrats and liberals were guilty of treason. Now, Coulter calls Republicans, conservatives, and Christians “traitors” for disagreeing with her on one single issue: immigration. Back then, the entirety of the Left were treasonous in Coulter’s eyes. Now, a huge swath on the Right have joined their ranks. Oh, and, by the way, Coulter’s definition of “treason” is not a legal one, but an elastic one dependent upon her own personal whim. Moreover, Coulter misuses the term for its effect as emotional vernacular to bypass reason and facts. A gifted linguist, Coulter is, indeed, adept at propaganda. She knows how to manipulate language to manipulate people. Orwell’s Newspeak and doublethink could have been designed just for her. The entire tweet in all of its particulars is incorrect. Coulter consistently claims a conspiracy among political and media elites to foil Trump’s candidacy. According to Coulter, Fox News is part of that grand conspiracy. As of January 26, 2016, Donald Trump had already appeared on Fox News and Fox Business News 132 times – far more than any other candidate. That number has undoubtedly skyrocketed since then. Entire MSM? The mainstream media is hardly a monolith and it has provided more coverage of Trump than any other candidate in any other election in history. It covers Trump rallies and speeches, often without commentary, while overlooking other candidates. Trump gets air time whenever he wants it. Also, Trump has bullied many media outlets into acquiescence. The Media Research Center frequently notes the disparate coverage afforded Trump at the expense of his opponents, even in GOP debates. Most recently, Breitbart, known as Trump’s personal Pravda, has come under fire for covering up Trump scandals and betraying its reporters and readers. The Sun Times reported that the media “gave Trump $400 million worth of free coverage in just one month’s time.” In total, Trump has received about $2 billion in free air time. Salem Radio? Salem Radio is hardly part of a Vast Left and Right Wing Conspiracy. Sadly, many Christian leaders have actually jumped aboard the Trump bandwagon, seemingly willing to abandon both biblical and conservative principles for the elevation of someone they regard as a protector of their rights and freedoms. However, Trump is merely a bloviating bully with disdain for the Constitution and he would govern with his own version of Obama’s pen and a phone. Every Major GOP Donor? GOP donors were hardly united against Trump. Many funded attacks against Cruz, Trump’s biggest rival. Immigration? Immigration – Trump’s (and Coulter’s) signature issue – regularly places around fourth in exit polling, demonstrating that Coulter is wrong about the reason for Trump’s success thus far. Voters are outraged, want change, and are looking for a strongman to forcefully reverse the course our government is presently on. Ironically, Coulter’s zealous devotion to Trump is itself predicated on a lie. Coulter insists that Trump is the best candidate on her core issue – immigration – yet, Trump has proven himself a fraud on immigration. Trump admits he is flexible on immigration and he actually promotes amnesty (“touchback deportation”). To ensure a Trump victory, Coulter has repeatedly lied about Ted Cruz, the one candidate who has a proven record of defending the border and preserving our national sovereignty. See “Coulter’s Dream Ticket: Trump-Romney” at http://wp.me/p4jHFp-cB. See “Ann Coulter’s Upside Down World” at http://wp.me/p4jHFp-cP. See “Coulter Hates All GOP Candidates But Trump” at http://wp.me/p4jHFp-bj. See “Coulter Lies About Supreme Court Case” at http://wp.me/p4jHFp-bE. See “Ann Coulter’s ‘Real’ Americans Fallacy” at http://wp.me/p4jHFp-9Y. Ann Coulter, 3/12/16, 12:16 a.m.
 Ann Coulter, 3/15/16, 7:55 p.m.
 See “Propaganda: George Orwell in the Age of Ann Coulter” at http://wp.me/p4jHFp-4j. See “Are Coulter’s ‘Facts’ Right?” at http://wp.me/p4jHFp-9E. See “Ignorant Ideologue” at http://wp.me/p4jHFp-br. Ann Coulter, 3/15/16, 5:50 p.m.
 Sean Hannity, Hannity, FNC, 1/26/16. Ann Coulter, “When ‘reform’ means tilting the balance of influence,” 10/20/99. See “How to Talk to a Bully (if you must)” at http://wp.me/p4jHFp-bY. 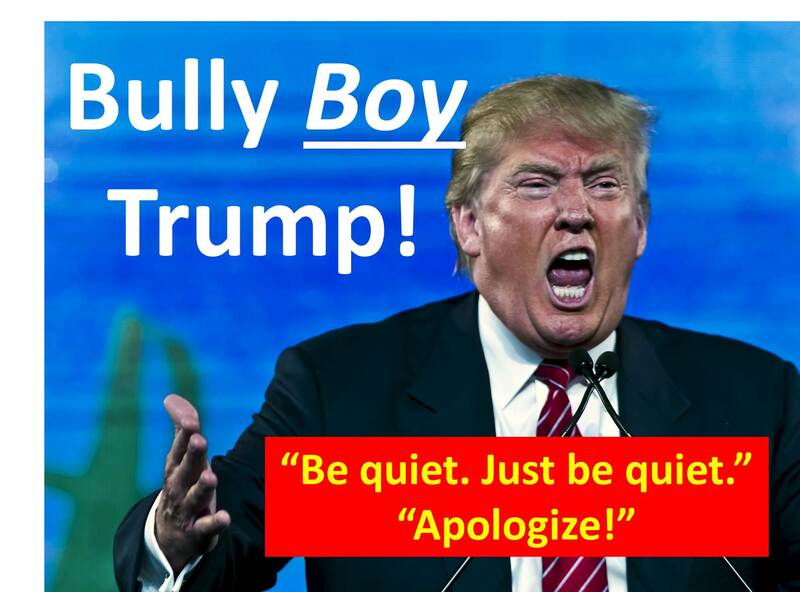 See “Bully Boy Trump” at http://wp.me/p4jHFp-cv. See “Trump’s Phony Wall” at http://wp.me/p4jHFp-cn. See “Coulter’s Desperate Lies About Cruz” at http://wp.me/p4jHFp-c8. Finding examples of Ann Coulter contradicting herself is easy, but finding another Coulter who refutes her is a rarity. Dr. Michael Coulter does just that. 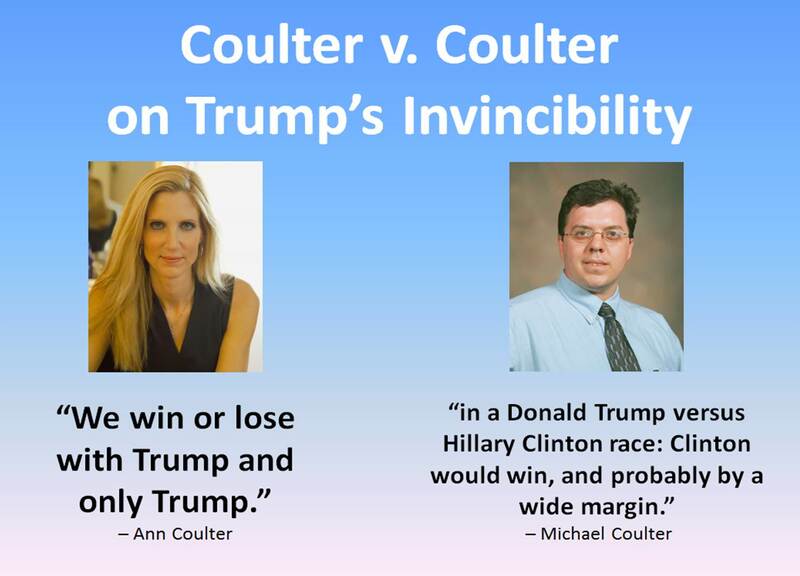 But the much more likely scenario, as Dr. Coulter points out, is a Trump defeat at the hands of whoever the Democrat nominee is. Ms. Coulter, who hates every GOP candidate save Trump (whom she blindly worships as her Savior), should heed Dr. Coulter, who has facts and sound analysis on his side. But Coulter is emotionally (and financially) invested in Trump. Indeed, she has staked what’s left of her diminishing reputation and career on Trump’s victory. Hence her willingness to sacrifice all of her conservative principles and Christian values to support a bully and a charlatan. Instead of supporting a genuine conservative (a proven constitutionalist and pro-lifer) like Ted Cruz, Coulter supports a RINO who would betray her on every issue. A Trump nomination would spell doom for America, Conservatism, and Ann Coulter. See “Coulter Crazy Over Trump” at http://wp.me/p4jHFp-c5. You are willing to sacrifice all of your conservative principles and Christian beliefs to get Trump elected president, solely on the premise that Trump is the only candidate who is “good on immigration.” You admit that Trump is not a conservative and that he does lie. Is Trump lying on immigration? Trump’s record and rhetoric on immigration suggest that he is lying about both the wall and deportation of illegal immigrants. Trump supported the Gang of Eight bill that you despise. Trump hired illegal aliens at the expense of American workers. Trump would “negotiate” on both the wall and immigration. Trump seeks touchback deportation to bring them back as quickly as possible – ahead of the line: amnesty! So, having sacrificed every principle and ideal you once held dear, you are supporting the one person you claim is good on immigration, and he is actually the worst on immigration. If Trump wins the presidency, America gets a liberal similar to Hillary and amnesty! You have sacrificed everything for nothing! Moreover, you have viciously attacked the one candidate who has a proven record of opposition to amnesty and fought for the preservation of American sovereignty: Ted Cruz! You regard Trump as your and America’s Savior and claim that you would marry Trump if he were available. You exalt Trump above the heavens and absolve him of all his faults. At the very same time, you demonize an actual conservative who is a strict constitutionalist and devout Christian and, ironically, is the only candidate who would do what you claim you want done about immigration. Instead, you promote a bully and a charlatan. If Trump wins the nomination and is victorious in the election, America has you to blame! But it is not too late! Will you forsake your pride, reverse course, and support the candidate who would actually do what you want to accomplish on immigration and who is also an actual conservative, constitutionalist, and Christian? What is more important to you, Ann? Your pride or America’s future? See “Coulter Bashes Cruz – Again!” at http://wp.me/p4jHFp-aZ. See “Vanity: Ann Coulter’s Quest for Glory” at http://wp.me/p4jHFp-3k.